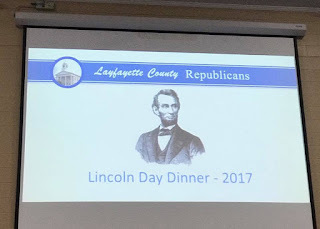 Large off-election-year crowd attends Lafayette County Republican Lincoln Dinner on April 27th. With 'All Eyes Forward' Lafayette County Republicans look to 2018 and 2020 election years with enthusiasm and are ready to get to work! 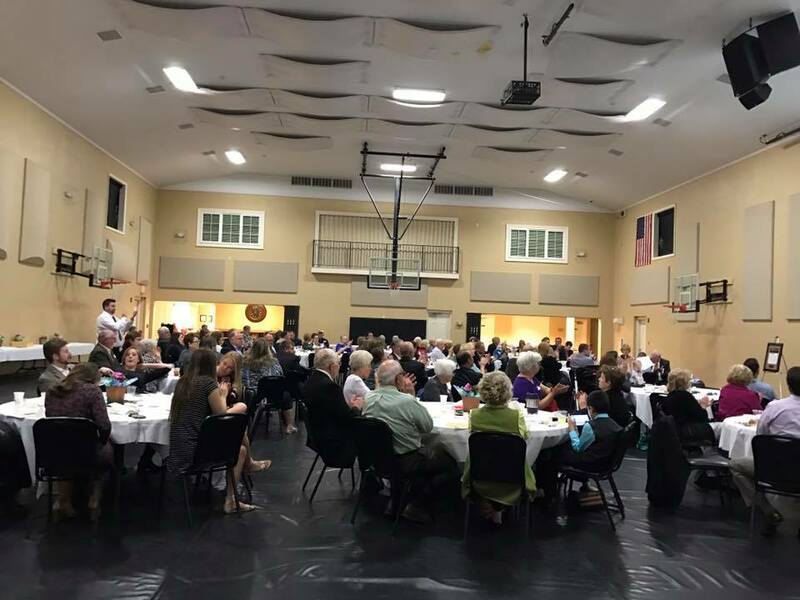 Thanks to the large group of volunteers and guests who attended our recent Lincoln Dinner celebration. Here is the evening in pictures. What a wonderful evening it was, too, with inspiring speakers and, as always, delicious food from Nadler's Catering. Thank you to everyone who helped plan the event and volunteered. The big screen at the Community Christian Center welcomed guests. A Lee Greenwood video of Trump's Inauguration was shown on this screen as well. 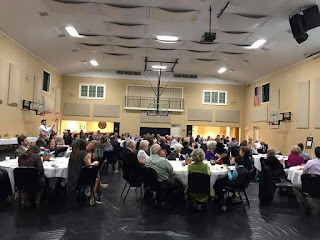 This is an excellent event venue that we are grateful to have available every year for our Lincoln Dinner. Austin Stukins, Executive Director of MoGOP. David Pearce, the master--Master of Ceremonies. Kay Hoflander, MoGOP Vice Chair, and Todd Graves MoGOP Chair. Austin Stukins, MoGOP Executive Director. Always eat dessert first! Nine dessert choices! Thanks to Nadler's Catering of Wellington for a their usual delicious dinner. State Rep. Glen Kolkmeyer (53rd District) discusses the new Missouri Bicentennial License Plate, soon to come. Kolkmeyer served as chair of the Bicentennial License Plate Committee. Michael Clarke of Senator Roy Blunt's Kansas City office presented a certificate and an American flag flown over the inauguration ceremony for President Donald Trump. This was a gift to Lafayette County Republicans from Senator Roy Blunt. 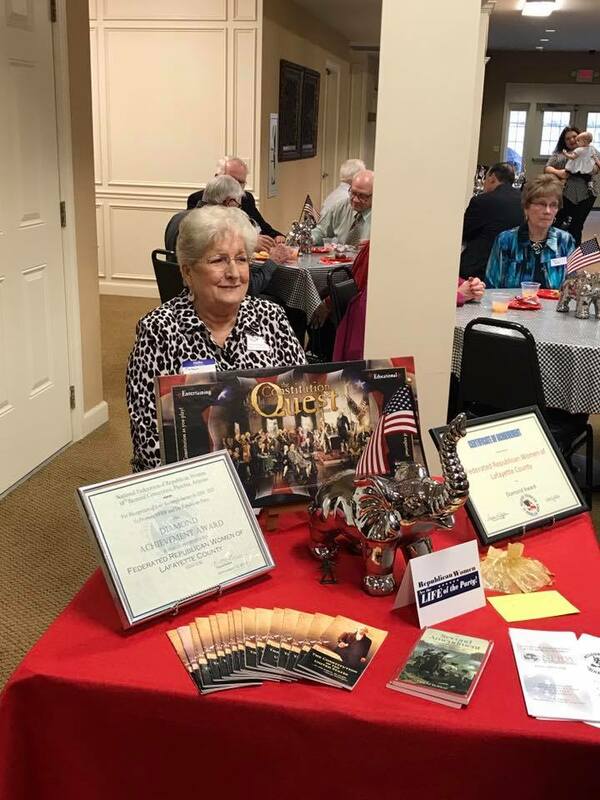 Eric Kolkmeyer auctioned the flag and certificate as a fundraiser for the Central Committee. Colleen Wieligman greeted Lincoln Dinner guests as they arrived. 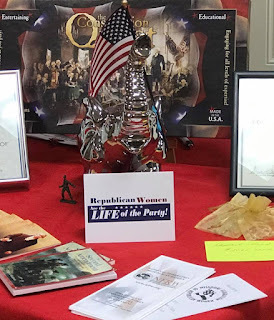 A table with information from our local FRW Club was available for anyone wanting to join FRW or gain more information about the local group. UCM College Republicans and UCM Young Americans for Freedom joined us at our LD 2017.
and Emma Ringsdorf, UCM Young American for Freedom. Rep. Glen Kolkmeyer congratulates Alice Jarman who recently received Lt. Governor Mike Parson's Senior Service Award. Kolkmeyer nominated her for that honor. Ceremonies were held at the Capitol this week. 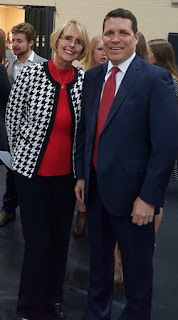 Rep. Glen Kolkmeyer with Lafayette County Recorder JoAnn Swartz. 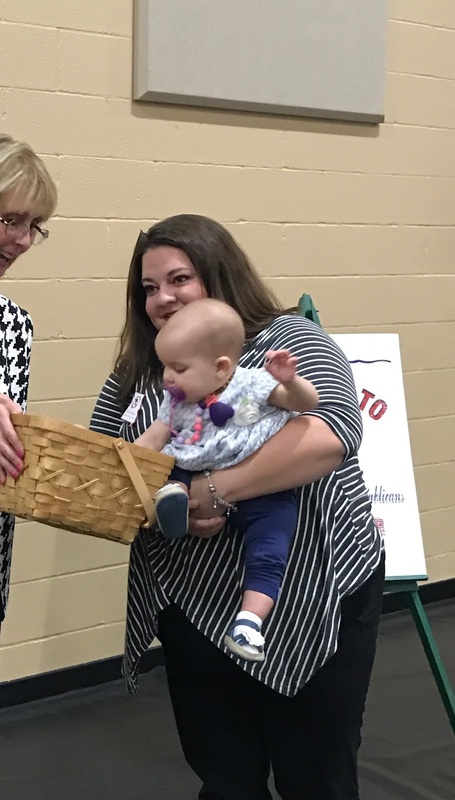 Kay Hoflander, county chair, with Emily Kolkmeyer Wilson and her baby daughter Mia. Miss Mia drew the winning raffle ticket from the basket. And she pulled it out on her first try. Thank you Mia! Associate Circuit Judge Russell Kruse gave the invocation. Linda Niendick, County Clerk, with Steel Shippy of the MO Secretary of State office. County Clerk Linda Niendick and Lafayette County MoFRW President Lana Crain. Another adorable Baby Mia photo. Pledge of Allegiance is always an important moment at any Republican event. Steele Shippy of Secretary of State Jay Ashcroft's office discusses Voter Photo ID implementation in Missouri. 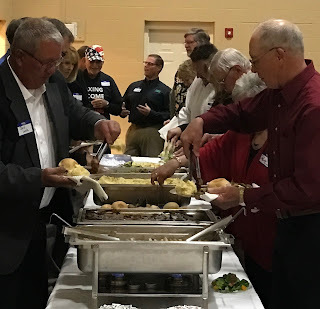 Steve Solomon, State Committeeman of the 21st Senatorial and Secretary of the Lafayette County Republican Central Committee, introduces Chairman Todd Graves. Linda Niendick and Lana Crain present Kay Hoflander, county chair and vice chair of the party, with a plaque on behalf of the Central Committee and the local FRW Club. The plaque featured a replica of a recent feature story on Kay from The Missouri Times magazine. Linda Niendick, County Clerk, discusses the meaning of the Pledge of Allegiance and asks the audience to think about the words as they say the Pledge. Thanks Linda for these meaningful remarks that are so important to remember. Lisa Kolkmeyer, secretary of the county FRW Club, leads the audience in singing the National Anthem. 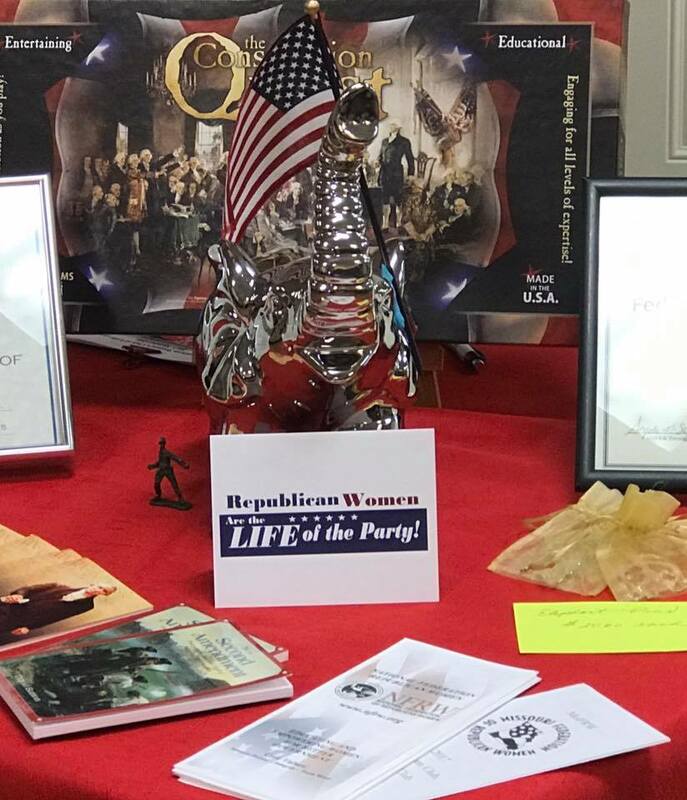 Beautiful flowers and table decorations by the Lafayette County Federated Republican Women's Club. Each year they provide the decorations for our Lincoln Dinner, and we cannot ever thank them enough. Lovely flowers ladies. Thank you! A reception before our event features yummy appetizers and a punch that was just Wow. Thank you to all the volunteers who provided the goodies. It's so much fun to meet and greet before our event. Meet-and-greet reception in the cafe area of the CCC. A few of the terrific silent auction items on hand for bidding. Thanks to all who brought them. This was a hit. A coffee table collectable book on President Donald Trump. We girls had a blast at LD 2017 in Lafcoland. From left: Miss Mollie Swift, Kay Hoflander, Lana Crain, president of the local FRW Club, and Doris Strickler, treasurer of Lafayette County FRW and Committeewoman from Lexington Township. Mark Schroer has some help at the front desk from Heidi and Eric Kolkmeyer's kiddos, Alea and Lucas. Pictured from left, front: Eric, Alea, Heidi, Lucas and Mark Schroer. Back, from left: Sally Nadler of Nadler's Catering, Steve Solomon, State Committeeman and Austin Stukins, MoGOP Exec. Director. 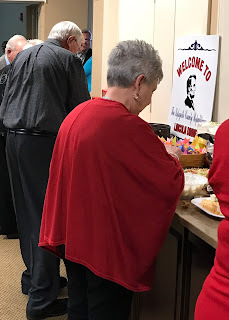 Pictured: Heidi Kolkmeyer, treasurer of Lafayette County Central Committee and Committeewoman from Clay Township. Heidi is a master at managing our 50-50 raffle each year at our LD. She also keeps our books and bank records and files our MEC reports. She makes it look easy, but we know it's not. We can't do all this without her. Thank you Heidi! 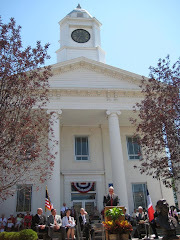 Pictured: Mark Schroer, Vice Chair of Lafayette County Central Committee and committeeman from Clay Township. Mark always mans the desk at our Lincoln Dinners, checks people in and handles the money. We can't thank him enough for taking care of all this for us year after year.